It has been two weeks since the tragic death of two of my close friends and fellow classmates. It is something no one is prepared for, and happens out of the blue. To add to these tragedies, I came to find that another friend was in a horrible accident over this last weekend which has put her on life support. Life is something many of us take for granted, and it is not until we are faced with times like these that we come to understand how important it is to enjoy your life every second of everyday. Life is too short to live for the fulfillment of someone else’s dreams or expectations. Your life is yours, and only yours. Do spend it always wishing you could do what makes YOU happy, while you are working for what people say is important. My friend Cindy wrote this only a couple days before her death. I feel like it captures and expresses exactly what she wanted and what we all should realize. Seize the day, and live everyday as if it were your last. As I started, what seemed to be a mundane and droogy day, I was able to come to a remarkable revelation. Although not totally out of the blue, I truely got to experience what the surce of my burdens lie. They lie in technology. technology? The thing that helps us with our everyday needs. The thing that helps us progress so much as a society. The one thing that we all utilize on a daily basis. The thing that allows me to covey this messege, and for you the reader to read it? These technologies are causing us all to be stuck behind a wall of flashing electrons all day, instead of enjoying the beautiful life that surrounds us. We waste countless hours on the internet, looking at things we don’t need and thinking about what we wish we had. All the while we are missing all of the great possibilites that are presented in front of us on a daily basis. We must understand that life is what is going on around you. Litterally. Not what is on these screens we have found ourselves sitting behind for the majority of our days. On what seemed to be an insignificant and gloomy day in San Jose, I was presented a pleasant surprise. It’s funny how something right in front of you can pass you by. 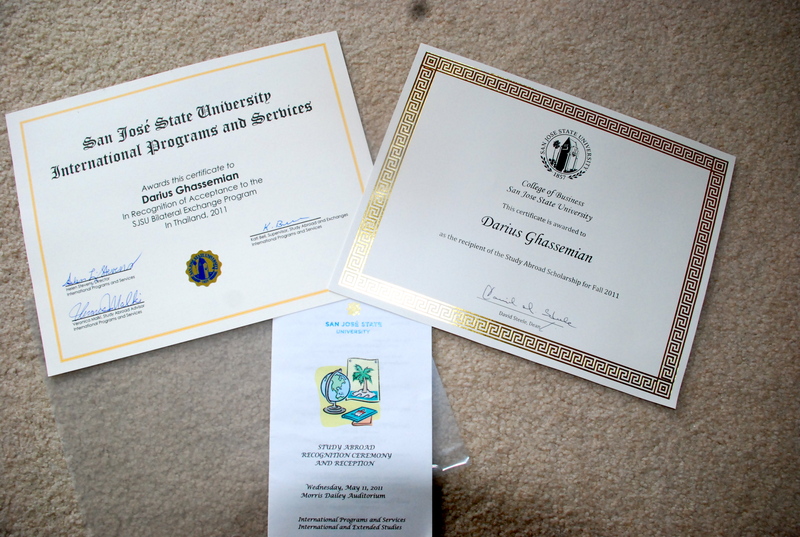 As I looked at the certificate I received from a ceremony held last Wednesday at San Jose State, I realized that there were two certificates, not only one. I was instantly puzzled as to what this second paper could have said, and more importantly, how I just noticed it this morning. It turned out to be a certificate awarding me a Scholarship from the College of Business. A total shock, as this was the first time I had heard anything about this. Although I haven’t relieved any other notices from anyone, or any money, just having this certificate makes me feel good. I guess the hard work and time I have put into school has paid off. Feels good for people to recognize it though. Enjoy the little things, they are what really gives our lives meaning. I woke up one morning and realized my life had hit a plateau. Nothing was new. I lived in same neighborhood in boring suburban San Jose all my life. I was surrounded by all of the same people, who all did same things. I saw no hope of any change. Was I going to fall into this trap? I had told myself time and time again that I wouldn’t, but it didn’t seem that way. So I decided that I was going to do something different. Something drastic. Something that I wanted to do. Not for anyone but myself. It was that morning that I decided I was moving to Thailand. So that was the start. The initial spark that led me to this journey. I am set to start school in Bangkok, Thailand on August 8th. So until then I will write about everything that leads up to my journey abroad.